A pair of tiny, squishy astronauts braved the harsh vacuum of space to rig a new communications system on to the International Space Station. The new system is part of reconfiguring the station in preparation for the arrival of space taxis from the commercial crew program. Astronauts Terry Virts and Barry "Butch" Wilmore successfully completed the third of a trio of spacewalks on Sunday to prepare the International Space Station for the commercial crew program. This spacewalk focused on installing a new communications system. What&apos;s Happening With Crew Transport To The Space Station? The main task for this spacewalk was to install a Common Communications for Visiting Vehicles (C2V2) system, a new system for standardizing audio and video communication with visiting spacecraft. 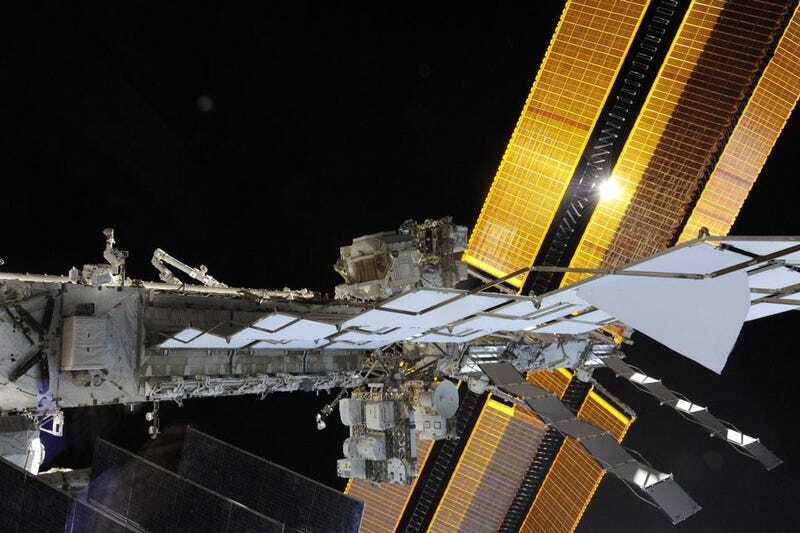 The installation required adding a pair of new booms with antennas and retro-reflectors, connecting the C2V2 to the GPS and antenna systems, and running about 120 meters of cable along the space station truss. In addition to their assigned To-Do list, the astronauts managed to once again accomplish a bonus task, retrieving a equipment cover bag from outside the station. Virts reported water in his helmet after the previous spacewalk when hooking back in to the space station atmospheric system. The water was attributed to sublimator water carryover, when residual water condenses during repressurization. Even so both astronauts made periodic reports of dry helmet conditions to ground control during this spacewalk. This was the final spacewalk in the planned reconfiguration trio. All tasks on the daily To-Do lists were completed on schedule. After the spacewalk, astronaut Terry Virts commemorated 50 years of spacwalking history.